A retired professional firefighter, Chuck Roydhouse, does not make compromises on chimney safety for his customers. 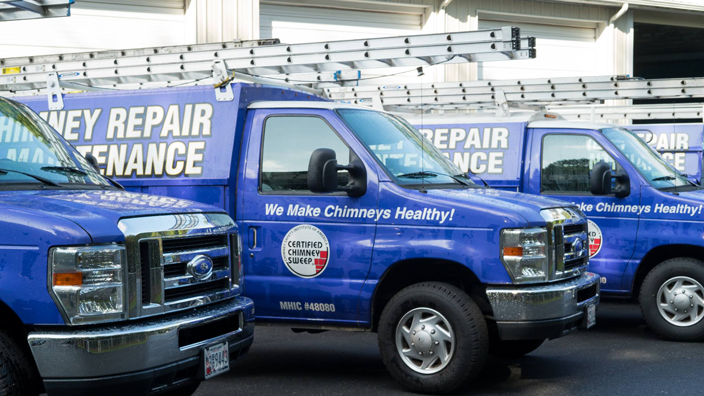 One of the very few CSIA certified chimney masters, he has built his company upon the core values of providing top quality services in the most efficient way. For him, this means highly trained CSIA certified field technicians, a rigid discipline of standard operating procedures, and organized state-of-the-art equipment and tools. All of these combined create efficiencies leading to profitability. Fueled by 39 years of knowledge and experience, Chuck and his wife Linda employ 4 field technicians and rate as a A+ BBB company (Better Business Bureau). Driven to improve industry standards and education, Chuck also serves on the Chimney Safety Institute of America’s Executive Board (CSIA) and is frequently a speaker at industry conventions. Successful and caring is how his community describes Clean Sweep of Anne Arundel County, Inc.
A firefighter relies on life-saving training and standard operating procedures, it saves lives. For Chuck, it was second nature to shape his staff’s job execution as a series of well-rehearsed disciplined actions. A well-oiled machine, Clean Sweep of Anne Arundel County already impressed its customers with a neat, competent, and organized approach to each job. Now, Chuck also wanted to find a solution to communicate professionally with his customers, as well as get ahead of the massive amount of daily incoming data from job activities. Several failed in-house efforts prompted an investigation and the implementation of some ‘big company name’ products, but these proved to be costly and a huge effort to set up. Each software fell short in covering the priority needs! Chuck and Linda felt they had to change their own ways to accommodate these systems. But changing already proven methods did not sit well with them. The first thing they noticed after trying out ServicePal, was the incredible ease of transitioning from what they were doing, to doing the same using ServicePal. “There is a wealth of forms available in the application and we could also just upload our own forms, reports, checklists and data. We are big on tight procedures and processes, and we found ServicePal was instantly in harmony with our ways of doing things, and integrated well with the rest of the company”, says Linda Roydhouse, President at Clean Sweep of Anne Arundel County, Inc.
Technology adoption can be hampered by employee’s fears or concerns, but Clean Sweep of Anne Arundel County’s field technicians embraced their changing environment. “Very quickly, the field techs spotted clear benefit to ServicePal. ServicePal was very user friendly, it was easy to be on the iPad, their job was now easier because it priced jobs out for them, and they were able to give instant answers on-site with professional output. It allowed them a much better level of service to the customers!”, it was Chuck’s wish come true. Instantly, ServicePal provided the ability to produce legible documents, reports, forms to the customer. This was huge and it built improve our communication with the customers! Clean Sweep of Anne Arundel County had just gained an impressive competitive advantage. Leveraging ServicePal, Chuck and Linda in the office are in sync with correct data from field jobs throughout the day. Gone are the days when a second shift would start at 5pm, when the trucks came rolling in with all the debriefs, all the pictures, all the questions. Reacting fast and correctly, using ServicePal, Chuck just armed his company with another additional business advantage over his competition. Real-time input from each job and each site job creates the advantage to get ahead on what the business needs. Clean Sweep of Anne Arundel County is known for having a solid business discipline and tight standard operating procedures such that each team can scale and offer consistent quality service. Providing employees structure, visibility and predictability in their jobs drives efficiencies. Chuck adds, “… and efficiencies is what makes you profitable”. “After we started using ServicePal, we noticed how much time we were gaining every single day. This quickly amounted to a 3 hour a day reduction for each person in the office! A whopping total of 36 hours 6 days a week!” Not only do we feel ServicePal gave us our lives back, we feel we run a lot smoother now”. As Clean Sweep of Anne Arundel County continues to innovate and optimize, Chuck and Linda’s business continues to grow. And they are confident that Servicepal will be there to support that growth. “Our mission is to provide the highest level of customer service, repairs and products to our customers, ServicePal helps us do that” concludes Chuck Roydhouse.